That creamy-looking balm up there is actually an oil. It's from Brazil and goes by the name Babassu Oil. I started getting acquainted with it sometime last year (or was it 2015?). I'll admit I've had quite a bit on my plate for longer than I care to admit, so when my first order arrived (way back when), it just sat there in the stockroom cooler for a couple of months. When I finally got around to testing it out, I fell in love. Let's have a look as what Babassu (also called Cusi) oil has to offer. Babassu (INCI: Orbignya oleifera) is a not just great for skin. It has also caught the attention of the textured hair crowd because of what it brings in the way of moisturizing and softening action to coils, kinks and curls. Babassu is comprised of 40% - 50% lauric acid. As a matter of fact, about 70% of babassu oil is lipids, which is why it has so much to offer. Apart from the generous amount of lauric acid, one also finds myristic, palmitic, oleic and stearic acid to make up the remainder of that 70%. If lauric acid bit is ringing a bell with you, it might be because you recognize it as the star component of coconut oil. Lauric acid is indeed what makes coconut oil such a fabulous ingredient. It is the lauric acid in coconut oil that is extracted for use as a mothers milk replacement. Babassu oil is being examined as a possible alternative to coconut oil for this very reason. Despite the lauric acid similarity, there are tangible differences between coconut and babassu oil. Coconut oil is umistakably greasy-feeling while babassu is quite the opposite. Babassu melts in super quick and even feels dry. And this is just one of the reasons I fell in love with it. Not only are non-oily feeling oils easy to work with when formulating for anyone who doesn't want a greasy feel (that pretty much includes all men and all children, and many women), it is also beautiful as a stand-alone ingredient. Babassu also has a neutral scent. 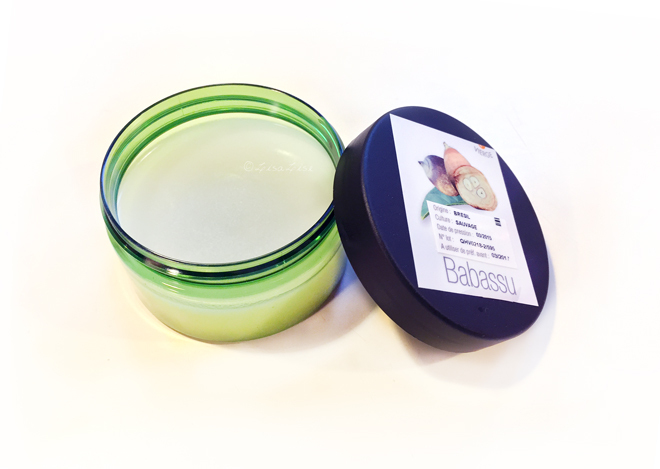 Apart from melting right in and not even coming close to being smelly, babassu has even more fabulous things to offer. There is also a possible negative to consider, though (hey, no ingredient is perfect, is it?). Remember the lauric acid I was talking about a minute ago? Lauric acid is classified as comedogenic, so that places babassu in the same comedogenic category as coconut oil. No need to panic though. The term comedogenic is often misunderstood (I did a post on that right here). I often get to know a new oil by trying it out solo. 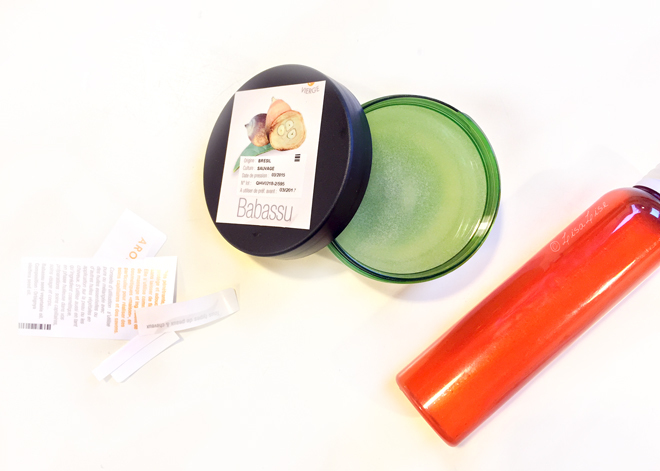 And even though I have used babassu in a few products, I'm still loving it straight out of the jar – as is. My supplier of babassu packages the oil in a bottle, making it near on impossible to get out of the container without placing it in a warm water bath first. That's not on. Can't wait that long! The impatient me devised this method. Are you a fan of babassu oil? How do you use it? I recently purchased babassu oil and am anxious to try it out in some DIY products. It is nice as a stand alone though�� thanks for the info. HI Suzanne - Please feel free to revisit this post and comment if you are willing to share what you use the oil in and how it works for you. I know I'd love to read about it! I am loving this oil! I just got a bit a few weeks ago and have tried it neat as well as in a lotion bar with kokum butter. This oil soaks in so well. I find it soaks into the skin way faster than coconut oil does. I can use it during the day and not leave greasy fingerprints everywhere.Can't wait to make more products with it! I just discovered your blog and am catching up on so many of your great posts - thanks for sharing them! Babassu oil is also next on my list of raw ingredients to try - interested to see how it gets on with curly hair. Hi, I have tried to access the Aroma Zone site, but seem to have trouble? Do they ship to the USA? Hi Karen - that sounds odd. As far as i know everything is in order and I am pretty sure they send to the USA. Yo Lisa! Great article!I bought babassu oil some time algo, eager to explore it... but the one I have does stink!too much! So, it's sitting there... But now that I read your post, I might try again! Thanks! 2. it has been processed in a different manner. I would contact your supplier and ask. I have seen this with other oils (some stinky and some quite neutral smelling) - so before tossing it, do get some feedback from your supplier. Best of luck!